The most recent issues of the Center for Rural Affairs' Rural Brief series offers an analysis of rural development spending and programs in the 2008 Farm Bill. It's not exactly an uplifting review. In comparison, the Farm Bill allocates only $150 million in mandatory spending for three rural development programs over the life of the Farm Bill. That is a 233:1 ratio of commodity subsidy spending to rural development spending. That's just pitiful, folks. Pitiful. 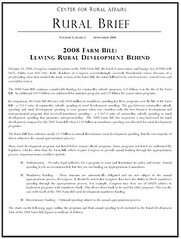 The 2008 Farm Bill also represents an 85% reduction in mandatory rural development spending compared to the 2002 Farm Bill when $1.03 billion in mandatory spending was allocated for rural development programs. Download a pdf of the full Rural Brief below.